Marvel Elsa Emma (Lehmkuhl) Biesterfelt died on November 2, 2006 and will be greatly missed by a multitude of friends and loved ones. She was born March 10, 1922 at home in Dayton Township, Bremer County, Iowa; as was her twin brother, Marvin. She was the daughter of Otto M. and Olga Meier Lehmkuhl. She was baptized in 1922 at St. John Lutheran Church, Buck Creek, and confirmed in the spring of 1937 at Grace Lutheran Church in Tripoli, Iowa. She graduated from Tripoli High School in 1941. On June 19, 1942, she married Edward Biesterfelt, in Bethany, MO. They spent most of their married life in Shell Rock, Tripoli, and then Cedar Falls where they resided until their deaths. Marvel was a faithful member of Bethlehem Lutheran Church in Cedar Falls. She worked at College Square Mall as Department Head of Linens at Younkers from 1968-1988. In retirement, she enjoyed travel of the Eastern part of the United States, vacations with her daughter and family. 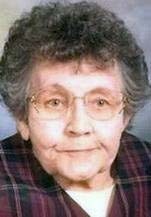 Her favorite spots were the Black Hills and visiting relatives in Butte, Nebraska. Later, she enjoyed visits from faithful friends, neighbors and family. She especially loved every single visit from the children in her life including family and neighbors. They always had a wonderful time together, sensing her love of them and her zest for life. All who knew Marvel loved her, her "spunky" attitude, sense of humor and most of all her willingness to help whoever, however she could! Marvel is survived by her daughter, Mary Dix of Iowa City and granddaughter, April and husband, Ralph Bryant of Marshalltown, and great granddaughter Amelia, her twin brother, Marvin Lehmkuhl and sister-in-law Maxine of Dresden, Tennessee. She was preceded in death by her husband; parents; and sister, Margaret Ashbrenner of California.